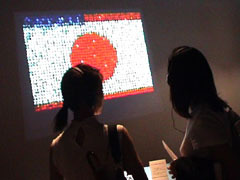 This month saw the launch of the MeX2001 project, including a live 3-hour webcast from a studio in the Tokyo suburbs, and a group exhibition of interactive and computer graphic artists at Axis Gallery. MeX was established with the intention of establishing channels of communication, distribution and creative collaboration between artists from different disciplines between Japan and Europe. 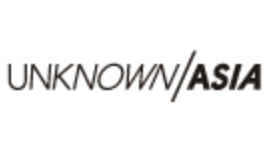 The project was formed by producer Hiromi Ito, who with the aid of a team of curators and advisors intends to link projects and creators by media exchange, showcasing works from web-based and video designers and directors, allowing access to information only available in a particular language, and developing a network of support and promotion during 2001. 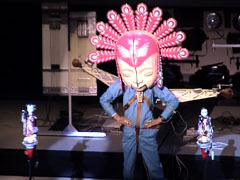 The opening webcast event – MeX Virtual Open Studio Live – at the TV studio of a technical college in Kamata, Kawasaki began with an energetic Japanese drum and dance performance, announcing the launch of MeX2001. 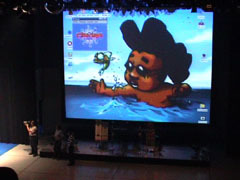 Taking the basic format of a TV art variety programme, live phone and webcam links were set-up between different creators studios in Europe, with a brief introduction of their works, as well as interviews with guests at the Tokyo studio. Among the highlights were a screening of selected animated films by Macoto Shinkai, as part of a presentation from Tokyo-based manga and anime portal site Mangazoo; a discussion with Olivier from Lille-based (France) Team cHmAn, who are currently in production of the Japanese versioning of their on-line interactive game interface Banja and presenting their web design jam event Vector Lounge in numerous locations around the world; and an explosive performance from the absurd sonic mechanics of Maywa Denki. 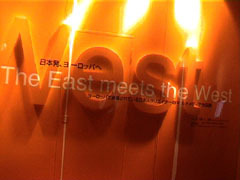 In a cross-promotional link with MeX2001, “The East meets The West” exhibition opened at the Axis Gallery in Roppongi. The show features works from 5 Japanese creators whose work has been presented and award-winning within international events Siggraph, Ars Electronica and Milia. CG director Morino Kazuma’s animated works as Stripe Factory feature collaborations with DJ Ken Ishii for a Space Shower TV on-air promo, metallic freak wrestlers in combat, and sequential runners, a study in body and motion. The ‘Micro Plantation’ exhibit created by Oishi Akinori was initially developed as animated content for mobile phones, with simple monochrome blocks and characters which interact with the user. Another of Oishi’s works composed of a layered cityscape of animated elements with organic movement and interactivity according to the users actions. There is obvious potential commercial use for many of the interfaces within the featured installations with young artists able to emulate the success and innovation of other multiple media creators like Iwai Toshio. SHIFT interviewed Hiromi Ito on her aims and inspiration for MeX2001. First of all, please could you introduce yourself. I’m working as a freelance media exchange producer. I introduce European CG short films and animator to Japanese people. Also I do Japanese images and talented creators to Europe. Before doing this job, I was in Alias-Wavefront, a 3DCG software company, as a marketing communication’s manager in Asia Pacific section. Tell us more about MEX 2001. What were your inspirations, and what are your aims with the project ? MeX is a plat form to promote the exchange between visual creators and other people involved. If you would like to produce new and creative contents, you should know each other. So, you should know the partner and introduce yourself in order to explore the chance for collaboration. Personally, I have encountered the chance to see CG works in and out of Japan since I was working in Alias-Wavefront. I always felt Japanese creator is not recognized abroad even by among parties concerned. After becoming a freelance, I contacted more people involved in CG images and young creators. Then I found the reason why creative Japanese people are not marked is their way of appeal is wrong. While, I learnt there are a lot of people who want to work with Japanese among European CG or animation industry. I also saw there are many young people in Europe who love Japanese subculture such as animation, games and comics, and respect Japanese culture. They would like to work in Japan as well, however, they do not know where or whom they should approach. There seem to be an invisible wall in Japan. It is not only wall of Japanese language. In short, they require connection in Japan. Many of them seem to prefer to gather and work with their own vocabulary, and their particular way to do. Much less there is no official trade fair for business dealing contents or projects. Then I made up my mind to start a platform for exchanges contents, creators, projects and contests. It would be the best goal for me if MeX evolve opportunities for trade fairs of contents. What kind of productions and events are you planning ? First, I mention a site ‘e-showcase’ introducing profiles. It is on MeX Web and creators and studios can introduce themselves in it (free of charge, no limit for times of update). Also associations or companies such as contests or events can appeal to find creative people. This showcase is aiming at making opportunities to start new things with attractive partners. 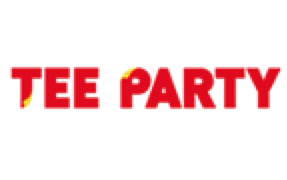 I also hope to help the registrants to do something. 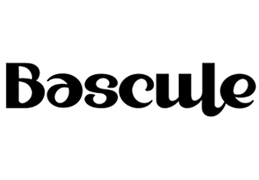 Then, we are going to screen European CG short films. 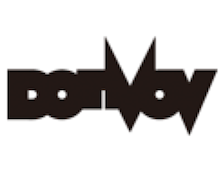 This will be held at Toriwood, theater for short films, in Tokyo. Moreover, we are planning to show them in other area in Japan. For example, it could be at internet cafes in various cities with archives of the films. We will invite some of works for the road show at MeX Web. Furthermore, in September, Film Gallery will be held in World PC Expo, Makuhari. This short film road show is thanks to the cooperation with Annecy International Animation Festival as well as World PC Expo. There will be excellent works from Annecy 2001. We are going to hold an European-Japanese exchange event with internet live as the closing event of MeX in November. Before that, we are going to set an animation championship with characters from Banja, a popular web community in Europe. Then, we will have the present ceremony in the closing event. We will give these information on the MeX Web. Do you have any particular favourite area of art or design, and why ? I do not have special one. Either I am not interested in art history (Who create what when). For me, the power to move people is important to see contents. I am not attracted to just beautiful, shocking, something new, or real CG. I personally hope to help creators who are looking for contents with energy to move their mind. What or who are you inspired by ? I have liked Japanese comic story tellers and French movies since I was a child. They might have influenced on me to be interested in contents. We can see American films anywhere even with low quality, but there are not so many opportunities to see films from other countries. This tendency would not be only in Japan. I guess it is because people having money have grabbed contents market for these few decades. Entertainment does not mean only American style films. The word ‘entertainment’ sometimes imply cheep nonsense, but I think different. The contents enable people to move their mind into happiness should be the heart of entertainment. They will be getting bored with entertainment always towards the same direction. Any plans for the immediate future ? MeX 2001 will be completed till the end of November, because all the members of MeX is working as a volunteer staff and it is hard to work for long time. However, I hope to set a platform for the creative not only from Europe and Japan but also from all around the world in 2002 coming. To realize it, we need sponsors and official organization supporting us. This year, French Embassy Cultural Section, Germany Cultural Center, Finland Center have supported MeX. Also private companies has given us mental and material support. We really would like more people, especially Japanese official association to aid us. Of course, funding support is very welcomed. Any message to global design community ? Japanese people have linguistic wall. Due to it, there are lots of people who is afraid to communicate with people from foreign countries (people from the other groups). While in fact, there are also many who have desire to start something new through the communication with people from ‘the other groups’. Let’s produce contents to move your mind having respect to each culture and creativity. We are getting the new tool that broad band internet. Let’s create contents to maximize this tool. Then we can make a business platform for creative people live with their main occupation.